Summer’s long gone and the ski season is fast approaching. The staff at PremiAir Parking Edinburgh aren’t too hot on the slopes but we do love ski season. Here’s our top 5 reasons why. Skiing, or snowboarding, is great fun. There’s not much better than being out in the fresh mountain air, recharging your batteries and invigorating your body and soul. 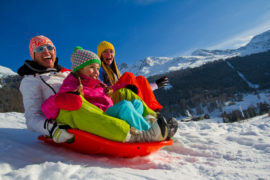 Release the stress of daily life by flying down the snow-covered mountains. The exhilaration you feel as you zig zag over fresh snow takes a lot of beating. There’s plenty to do on a skiing holiday, other than just skiing and snowboarding. Resorts often have their own unique charm and qualities and some are packed full of bars, restaurants, and clubs to keep you entertained after a day at the slopes. Below are 3 Apres Ski resorts that’ll guarantee you a great time after a hard day hitting the white stuff. Livigno, Italy – Great skiing, beautiful surroundings and good value food and drink – Livigno really does offer La Dolce Vita (the sweet life). It’s duty-free here, meaning even the cocktails are cheap enough and the partying is fun and unaffected. Zermatt, Switzerland – Strict zoning laws keep Zermatt looking like a fairytale mountain village – no building can be built higher than a four-story chalet. Don’t let its demure looks deceive you, however, this world class resort packs a mighty après ski punch. Being connected with nature when out skiing is heavenly. There’s nothing better than standing on top of a mountain and taking in the breathtaking scenery before gliding down the piste. Skiing gives you the opportunity to interact with nature in a way that you simply cannot find in many other activities. You learn to use the natural terrain features to move down the mountain. Find a harmonious flow with the terrain, that gives you a balance where you are at one with the mountain. You’ll find the true value of your ski holiday once you step back, relax and take in a peaceful moment in your natural surroundings, right before you launch yourself down the mountain! You don’t need to be a doctor to know that a healthy body is linked to a healthy mind. Skiing works the core muscle groups of your body, helps you to improve your balance, posture and increase body strength – it’s the perfect way to exercise during the Winter. One of the easiest ways to meet new people is by sharing a common interest. What better way to do that than on the mountain with other like-minded skiers who share the same passion (or in some cases obsession) as you do! Chat to a stranger on the chairlift and then challenge them to a ride down the mountain. When you’re about to jet off on holiday, the last thing you want is to be checking all the many car parks at Edinburgh Airport trying to find a space to leave your vehicle – so let PremiAir take some of the strain with secure parking that’s just a stone’s throw from your departure point. Located just a three-minute bus ride from the airport, our modern coaches are on hand to whisk you and your family to the terminal building. For more information about the airport parking services on offer at PremiAir, please feel free to browse the rest of our site and obtain a quote.